Feeding: The Borgi loves to eat anything so you don't have to worry about them being picky eaters. Personality: The Borgi is a very sweet dog who can be very "talkative". They love to play fetch, tug-o-war and even soccer. They may like to swim once they get used to it. Temperament: The Borgi is an extremely comical and fun dog. They are very lovey and love to play. When they are ready for napping or sleeping, they prefer not to be bothered. They are just too busy to be a lap dog. They love everyone and other animals as well. They could be classified as a nanny dog who will get between family members if tempers flair. They will try to keep the family in one herd. They have been known to nip at children who squeal. Family Dog: The Borgi makes a wonderful family dog. They love children and are tolerant of small pets and animals larger than themselves. Shedding: The amount and times a Borgi sheds can depend on the coat type. It is possible for the Borgi to shed heavily twice a year and an average amount throughout the year or shed their entire coat once a year. Grooming: The Borgi requires minimal to moderate grooming. They should be brushed occasionally to remove some lose hair and dust. They can be bathed when necessary. Training: The Borgi is extremely smart and can learn basic commands and housebreaking in very short order. They need a confident trainer to succeed. Behavior: The Borgi is an extremely intelligent, family oriented, protective dog. Barking: The Borgi does like to talk and will bark at intruders. Barks when herding or, trying to protect someone. Weather: The Borgi is able to withstand both extremes from -30F to 100F. However they should not be left out all day when the weather is extreme on either end of the temperature ranges. Exercise: The Borgi needs lots of physical and mental exercise. They like to swim and go for walks. A good sized yard to play in and long walks will do them fine. When inside, they loves to play and exercise but will calm down after playtime and lie quietly in the corner. Physical Ability: The Borgi is a very quck and agile dog. Living Conditions: Due to their great adaptive nature and sturdiness, the Borgi makes an excellent indoor dog as well as hardy enough to be an outside dog, even in northern climates. They can live in apartment but would do better in a home with a large yard. Appearance: Most of the Borgi's characteristics follow along the Pembroke's description. They have short legs, pointed, erect ears, fox-shaped face, average sized muzzle and dark brown eyes with a bright, intelligent gaze. They have a long tail like the Border Collie. Their coat is Black or Brown with White markings and can be either short or longer and wavy. Size: The Borgi can be between 10 to 21 inches tall and weighs around 30 to 40 pounds. Companionship: The Borgi is quite devoted to their family. They are very loving and like to be around people all the time. Some even refuse to eat if someone is not in the room with them. Nose: The nose of the Borgi is black in color. Eyes: The eyes of the Borgi are dark brown in color. 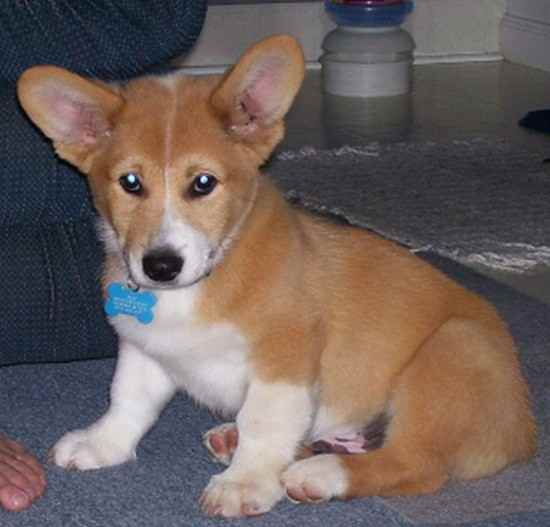 Ears: The Borgi has erect ears like the Corgi. Teeth/Bite: Some nipping when herding. Neck: The Borgi has a thick, stout neck. Body: The Borgi is a very athletic dog with a short, stout, muscular build with little fat. Forequarters: The Borgi has strong forequarters that are built for weight carrying like a Corgi. Gait: The Borgi can have a soft footed gait like the Border Collie or it can resemble the hopalong style of the Corgi. Tail: The Borgi can have a long tail like the Border Collie or it may be docked. Color: The coat of the Borgi can be black and white, black and brown, tri-colored,or even Red And white. Coat: The Borgi typically has a short, thick, smooth, coarse, wiry, water-resistant outercoat with a soft undercoat. They may have the longer wavy coat like the Border Collie. Life Expectancy: The life expectancy of a Borgi is about 16 years. One reported Borgi is 8 years old and still thinks she's a puppy, with perfect health. She could probably go on for another 8 years or more without a problem. Characteristics: The Borgi is a smart, funny and generally happy dog. Some may have slight additude from being too smart. Most love to swim and play fetch. The Borgi makes an excellent herding dog, family pet and watchdog. They can be athletic like the Border Collie at times and calm like the Pembroke Corgi at others. More Info: The Borgi is very adaptible to traveling. One has been on 2 long 14 hours car trips (one way mileage) plus other trips ranging from 7 hours to around town excursions and is excellent while traveling. Skin Health: The Borgi may be prone to dry, itchy skin. Ear Health: The Borgi may be prone to swimmers ear. Litter Size: The average litter size of the Borgie is 3 to 8 pups. * The most accurate way to determine characteristics of a mixed breed is by researching the parent breeds. ** Not all dogs being represented by this name consist of the exact percentages listed above. *** It is important to do research on your dog's history before choosing a dog. We are dedicated to providing the most accurate information possible about each breed.